It seems to be that the product seems to be available without restrictions to the public, as you can redistribute and modify it at will. It sounds like open source is like throwing something into the public domain? So is there a difference between works classified as open source, and works in the public domain? What's the difference between the two? In a copyright context, public domain is a term which means the set of creative works not under copyright, because the work's copyright has either expired, never existed (such as U.S. government works), or been forfeited1. Generally, no special restrictions apply to the reuse of public domain works, and they can be freely modified and redistributed without limitation. Open source software, as defined by the Open Source Initiative's Open Source Definition, means software whose source code is available and can be freely modified and distributed. Open source software is typically still under copyright (i.e., typically not in the public domain), but the author grants rights to users via a copyright license. Open source software and public domain software are by no means the same thing, but there is some overlap. Open source software can be in the public domain, and public domain software can satisfy the open source definition. Public domain software might not include source code. 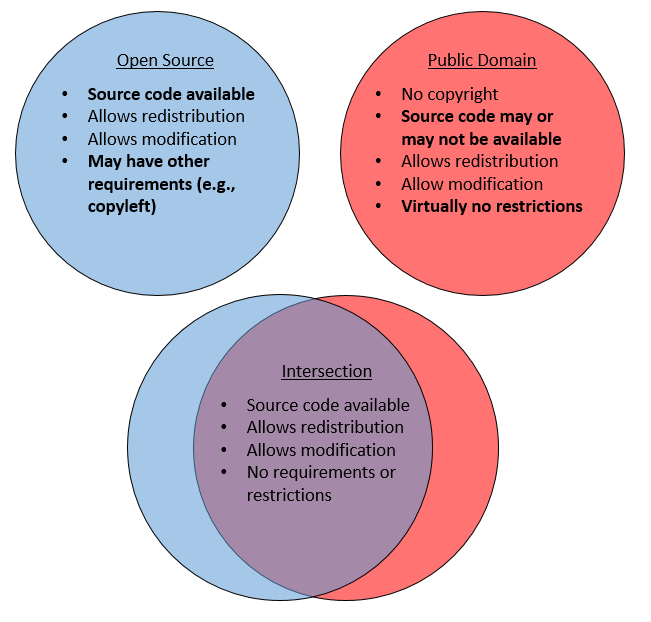 Since public domain software automatically allows redistribution and modification, it satisfies almost all of the open source criteria automatically, but not quite. It is notably missing the requirement that the program's source code be publicly available. It is therefore possible to have a piece of software in public domain that fails to satisfy the open source definition because its corresponding source code is unavailable. Open source software can grant a more limited set of rights than public domain. Like public domain works, open source software grants the right to modify and redistribute the work. However, an open source license may impose other restrictions that do not exist on public domain works. For example, the GNU GPL requires copyleft: any derived work that uses GPL-licensed material may only be distributed under the terms of the GPL. Such a restriction does not violate the open source definition, but it is certainly far stricter than the public domain. Open source software can be released under different licenses by the author. The author of a copyrighted open source program can issue multiple licenses on the work. A common case of this is when an author licenses a program under a copyleft license, but will also issue individual proprietary licenses for a fee. Users can either get the software free of charge under copyleft rules, or pay money to get the software under another license. (See OSS Watch's article "Dual-Licensing as a Business Model" and the Free Software Foundation's "Selling Exceptions to the GNU GPL".) Such a scheme is impossible with public domain software, because it relies on the author licensing the work's copyright in different ways. Since public domain software has no copyright, there is nothing to license. Open source licenses may grant patent rights. Public domain software does not have any copyright on it, but its reuse may still be restricted by patents, if it contains an implementation of a patented mechanism. If you redistributed such patent-encumbered public domain software, you would not be liable for copyright infringement but may be liable for patent infringement. Some open source licenses, however, expressly grant you patent rights. For example, an author who releases software under the Apache Public License or GNU GPL (version 3) expressly grants recipients the right to use any of the authors' patents that apply to the software, so there is no risk of violating the author's patents.2 Not all open source licenses do this, but it is an option for open source software under a license, whereas it is not an option for license-free non-copyrighted public domain software. 1 Note that it is unclear if premature dedication to the public domain is truly possible in most jurisdictions. 2 If the author illegally used someone else's patented mechanism without permission in the software, a downstream redistributor could be legally liable for that infringement. The Public Domain in the US means the copyright of something is owned by nobody, and cannot be owned by anybody. Ownership. When something is in the Public Domain, nobody has intellectual property rights to it. When something is made available under some open source license, the creator keeps the copyright. Terms. When something is in the public domain, there are no license terms to follow because there is no license. You are permitted to use the work whichever way you see fit without one. When something is licensed under an open source license, each license sets its own set of conditions, which can differ drastically. Open source usually adds some restrictions. Common restrictions are the question of attribution of the original author, advertise with the software or relicense the software or modifications of it. Public domain implies that the author waives all rights, possibly including personal rights. This is not necessarily applicable to open-source (though it can be) - open-source software can be licensed, which removes it from public domain. Open source software can also be explicitly declared as public domain (which, technically, is a requirement to be considered as such - work without an obvious copyright notice or license is assumed to be proprietary and non-copyable). Open source does not mean without restrictions. For example the GPL license does not allow you to distribute the project without the source also being available. No, in places that have a concept of "public domain" that normally means "without copyright". However, Open Source Software generally means software which is licensed in such a way that it may be used freely (free as in freedom / libre, monetary cost has nothing to do with it). However, for something to be licensed it must still be under copyright (the license is just a limited grant of rights, but does not give you full rights to do whatever you want). "What's the difference between the two?" - The short answer is that open source requires agreement to a license, Public Domain is without restrictions. However, because the term Open Source is misleading here is my perception on the issue. Like most of life (and law) open source is not a binary yes or no, but can fall between the two depending upon the individual circumstances of the software/product/license/terminology combinations. The resultant fuzzy logic licensing of a complex project that pulls resources from multiple sources can result in much heated debate. I think of rights to using software code as sitting on a sliding scale. At one end is propriety software from a commercial organisation that keeps source code hidden and secret. At the other end is source code out in the wild that has no restrictions upon it at all, free to be used/changed/abused by everyone, this is software in the Public Domain. You need to slide the scale back a little for open source. How far the scale is slid back depends upon the particular licence. A bit for the MIT licence, a bit more for the GPL licence. It can be slid almost back to the beginning where source code is licensed as open for viewing and nothing else, no changes whatsoever, why? Just to see how it works and for interfacing purposes. This is not uncommon in industrial systems. Open source is mainly about source code, however, software can be in the Public Domain but the source code is kept secret (e.g. a programmer waivers rights to a little utility but keeps the source code under wraps). Furthermore time will eventually start contributing to Public Domain software. Once enough years have passed software falls out of copyright and becomes Public Domain. (Open source licenses then lapse.) When that happens the source code no longer needs to be readily available for the compiled files. Thus, perversely, in the very long run, this could cause beneficial changes to source code not being available. The issue of what it means to have free rights to the software is often misunderstood. The free is about freedom of expression, not cost. Some misunderstand this and think open source is free of cost. Open source software can be sold, as long as the code comes with it (though the purchaser is then able to provide the software without selling it). This is also why open source software can be sold on disc media, mainly to cover the costs of production and distribution. Again perversely once the software is in the Public Domain there is nothing stopping organisations from modifying/renaming it then selling the product and not releasing the software's source code. So open source is mainly about freedom of expression, but need not be, and is not in some cases. Public Domain is about freedom in all senses, expression and cost, but that may lead to software becoming less free. One reason why the term Open Source is disliked by some is that it is misunderstood and misused. If you want true freedom of expression in software then open source is not an appropriate term. Nor is releasing it into the Public Domain (waiving all your rights). Hence the GPL license is probably the most free licence. Though some perceive it as restrictive, but strangely it needs to be to allow for full freedom of expression. I would consider "freedom software" as a proper term for truly free open source software (GPLed). Unfortunately "open source" dominates and as an umbrella term that is not truly free software. On the other hand, the very definition of Free software is blurry and depends on whom you're talking to. It definitely includes licenses like MIT and GPL, it definitely implies being Open Source, it definitely is incompatible with being Proprietary, I'm not so sure how it relates to Public Domain, my personal perception is that they are disjoint, but that depends on where I place the blurry line. Public Domain software is a strange beast. As said, it's my interpretation to put it outside of the Free Software. Whether you get the sources, or not, depends on what the author of the software decided to do. So, if it's Public Domain and you get the sources, it is not Proprietary. If it's Public Domain and you do not get the sources, you can call it Proprietary. Please note that I'm nowhere speaking of price, that's a totally different story, independent from what we're discussing here. so, short answer: Public Domain may be Open Source, or not. Not the answer you're looking for? Browse other questions tagged law public-domain or ask your own question. Is public domain open source?